The 22nd annual Widescreen Weekend takes place at the National Science and Media Museum from 11-14 October 2018, once again attracting visitors from around the world to experience one of the most eclectic programmes of film screenings found under one roof. Passes for the internationally renowned festival, which celebrates widescreen film formats and cinema technologies, are available from 23 May at scienceandmediamuseum.org.uk/widescreen-weekend. Regular guest curator, the film historian and author Sir Christopher Frayling, will be hand-picking a selection of Westerns, covering modern-day, vintage and the occasional left-field classic. 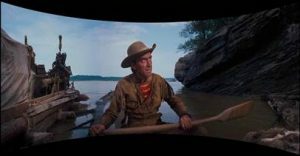 Among the highlights is a three-strip Cinerama screening of How the West Was Won (1962) featuring a cast of Hollywood greats including Henry Fonda, James Stewart and Debbie Reynolds. It will be shown in the museum’s Pictureville cinema – the only public Cinerama auditorium operating outside the USA. Also in the Western strand is Forty Guns (1957) starring Barbara Stanwyck as a fierce ranch-owner, in full CinemaScope glory. Forty Guns is one of the screenings in which the 2018 festival takes a closer look at women in widescreen, both in terms of notable female characters on screen, and women working behind the camera. Guest speakers discussing the subject include broadcaster and journalist Samira Ahmed, and Carin-Anne Strohmaier, VFX and assistant editor on numerous Hollywood hits including the Back to the Future and Indiana Jones series, and the Oscar-winning Forrest Gump. Cult classics and family films will once again take centre stage during Celluloid Saturday, a popular introduction at last year’s event which brings an eclectic mix of movies to showcase the qualities of non-digital screenings to audiences of all ages. Festival Director Kathryn Penny said: “We are already looking at one of the strongest Widescreen Weekend programmes I can remember, and I can’t wait to reveal the full details later this year. Avowed Western fans Christopher Frayling and Samira Ahmed will be here to introduce classics from one of cinema’s defining genres, and we will also be looking at the roles of women in the industry, both on screen and behind the scenes. An unusual treat for regulars is a rare outing for one of the very few surviving 70mm film copies of Mutiny on the Bounty (1962). Despite the film stock having lost much of its colour it was voted ‘most-wanted’ film in a poll at the 2017 event, and will be screened this year. Finally, the Student Widescreen Film of the Year returns to recognise new talent in widescreen filmmaking. The competition for ‘Best British’ and ‘Best International’ student widescreen film is now open, and the winners will be unveiled during the festival. Submissions can be made at https://filmfreeway.com/StudentWidescreenFilmoftheYear, before the 3 August closing date.